I am a sucker for the unusual and new, and often get roped into helping out with completely random activities. 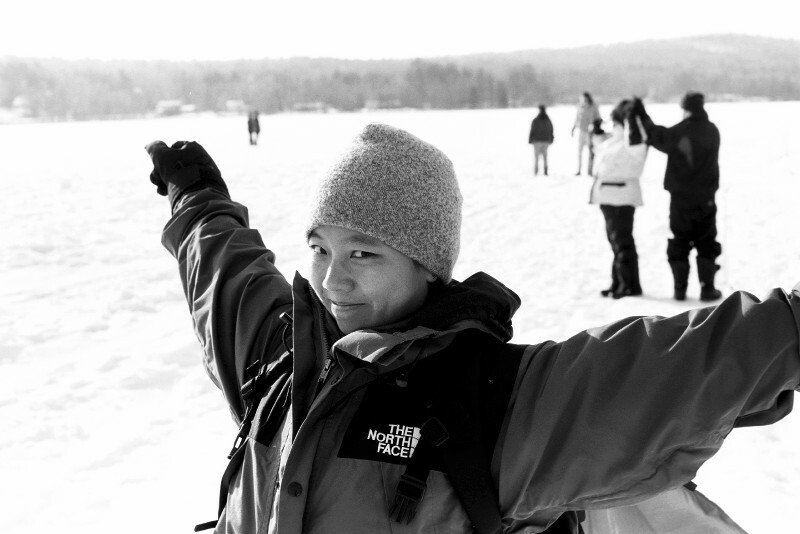 This one resulted from an off-hand comment about my interest in dog-sledding to Christine, the MIT Outing Club VP. 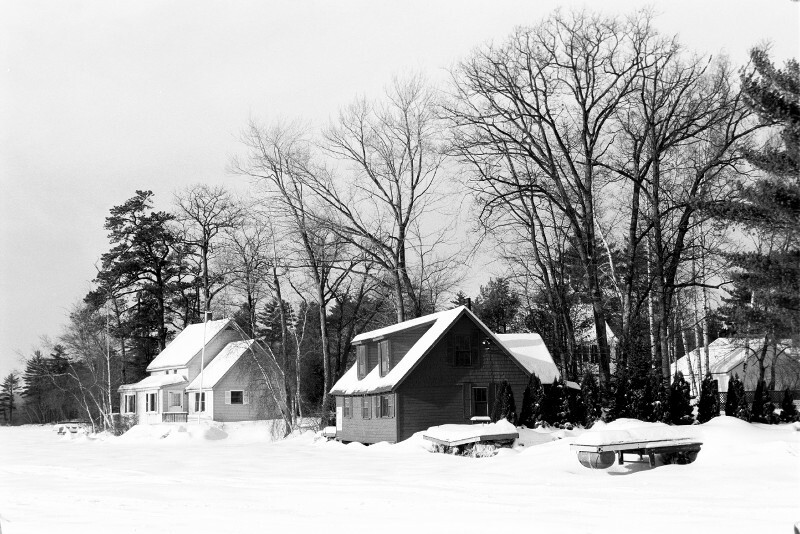 One cold January Friday, Christine called me about helping her out with transportation to a dogsled race, where she and a few other club members were supposed to help out. The only catch was that the race took place in Meredith, NH, and we had to be there at 9 am the next day. This meant that I would be skipping my usual Saturday long sleep-in. 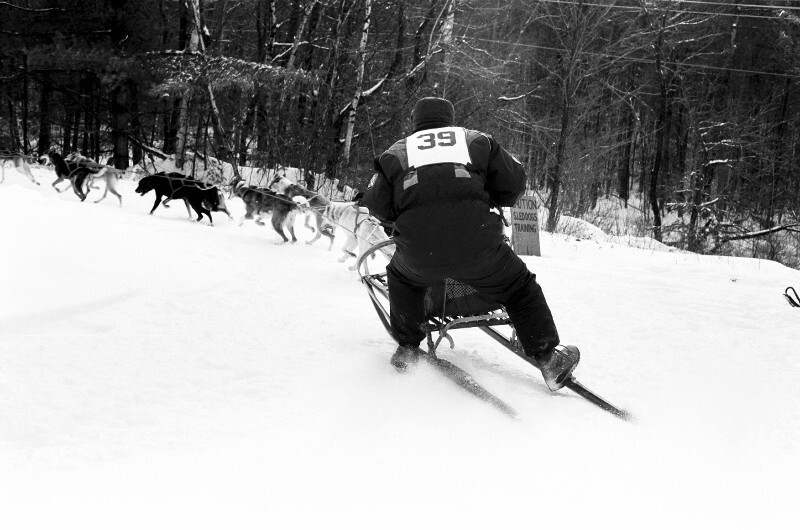 Since I had never before seen a dogsled race first hand, I decided that this chance was too good to pass up. So at 7 am or so on Saturday, our group left MIT and headed north. After a mandatory stop at the Einstein Brothers' Bagels in Concord (Exit 14) arrived at the race site - a frozen lake near Meredith. The set-up area itself occupied what looked like an empty lumber yard, with passage ways formed in between columns of pickup trucks. 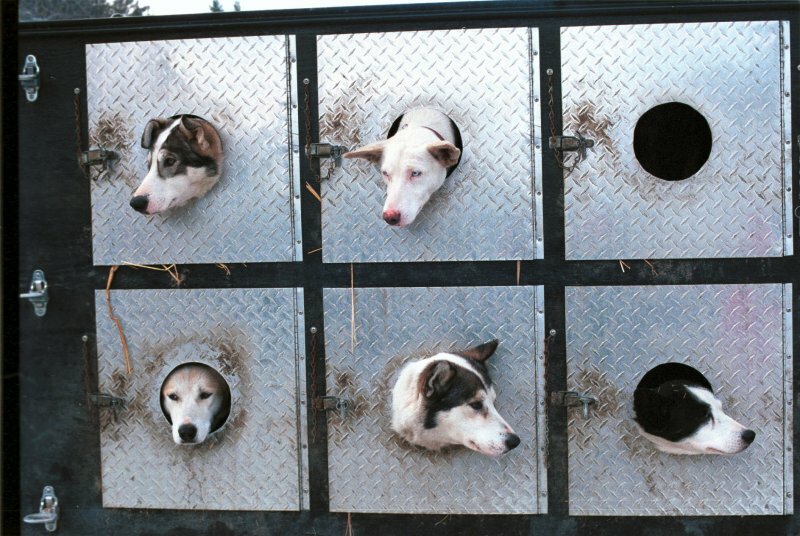 The trucks themselves were equipped with dog pens, which seemed awfully small at first, but the dogs did not seem to mind as they would be getting plenty of fresh air and exercise that day. 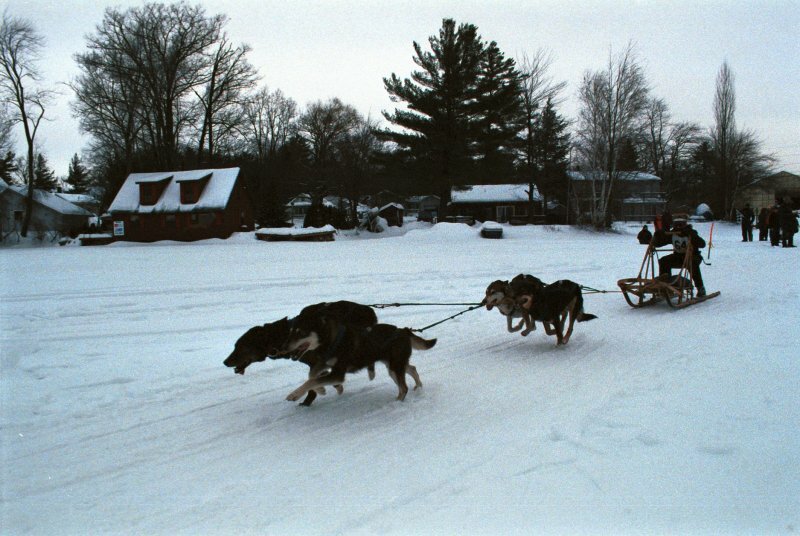 As our group meandered between the cars we wondered why the dogs looked so unlike the big and furry huskies that all of us associated with dog sleds. 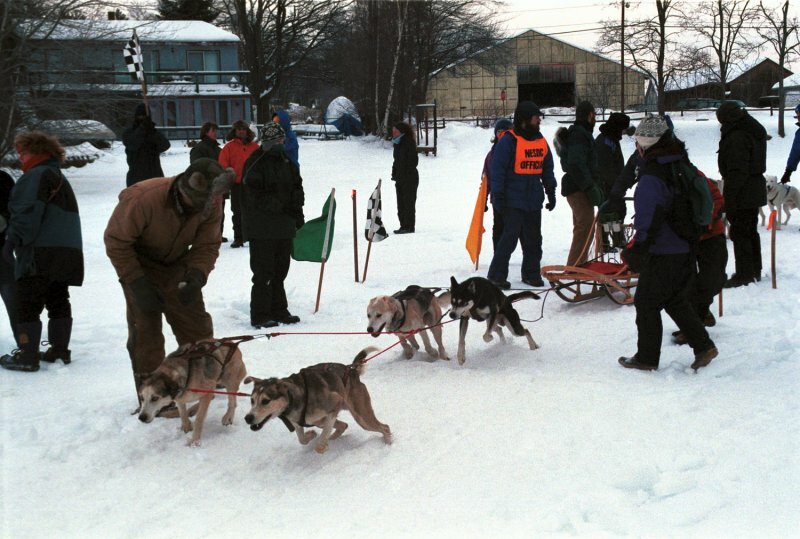 A pair of friendly racers finally told us that the breed most often used in the sprint races was actually a different breed altogether, generally referred to as Alaskan huskies. 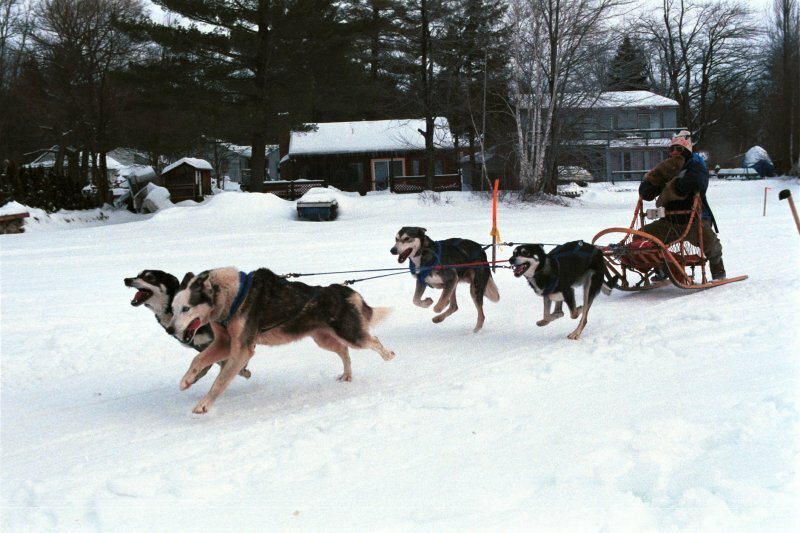 These dogs are bred for speed rather than endurance, and due to their short coats are better adapted to the milder climate of New England than true Siberian huskies. The crossing of breeds produces peculiar colorations in some dogs. 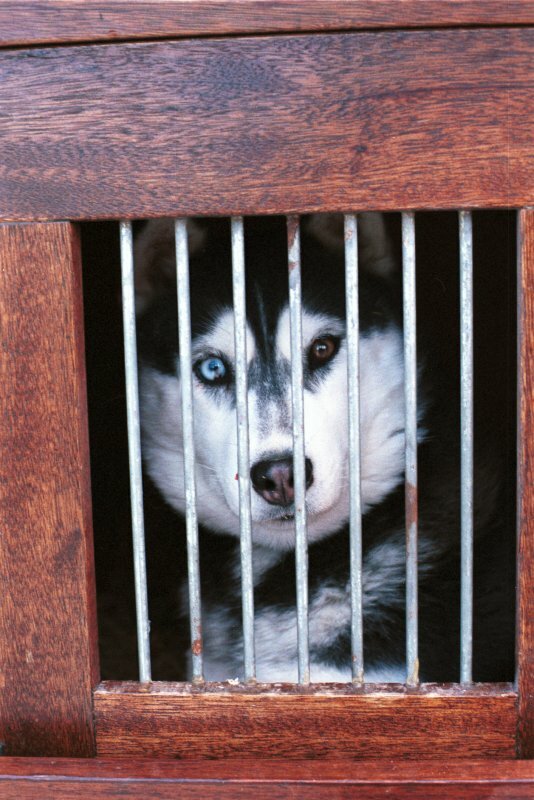 Perhaps the best example of this was a blue and brown eyed husky that stared at us from his pen. 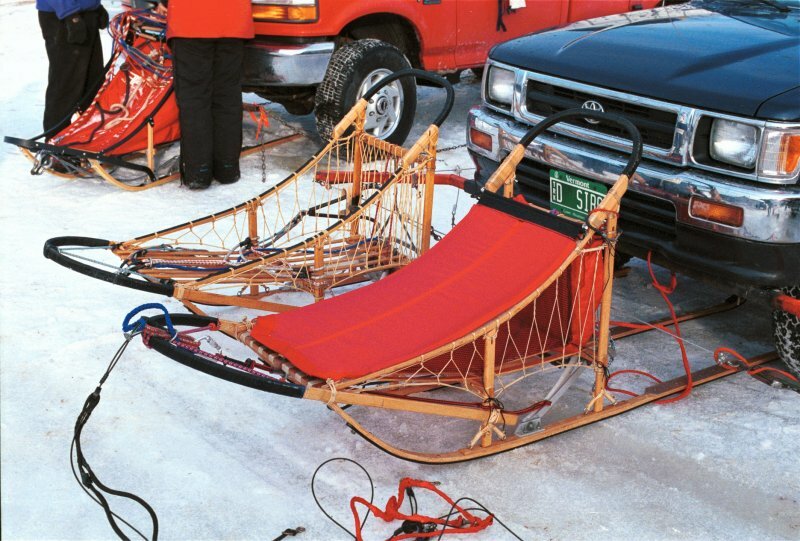 The sleds themselves are also quite interesting, and more complex than they seem at first glance. The traditional wood construction still dominates, made competitive by the addition of Teflon or other plastic runners. 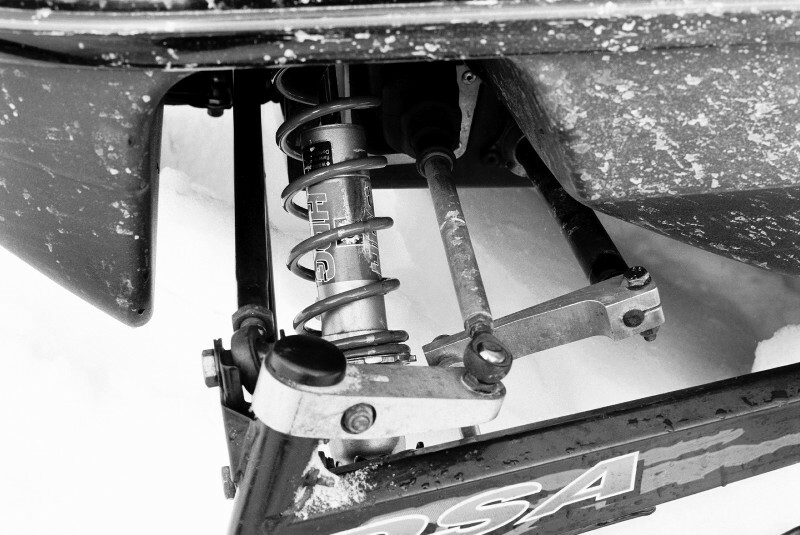 The sleds are quite flexible in torsion, allowing the racer to lean into turns and carve in a manner much similar to a skier. 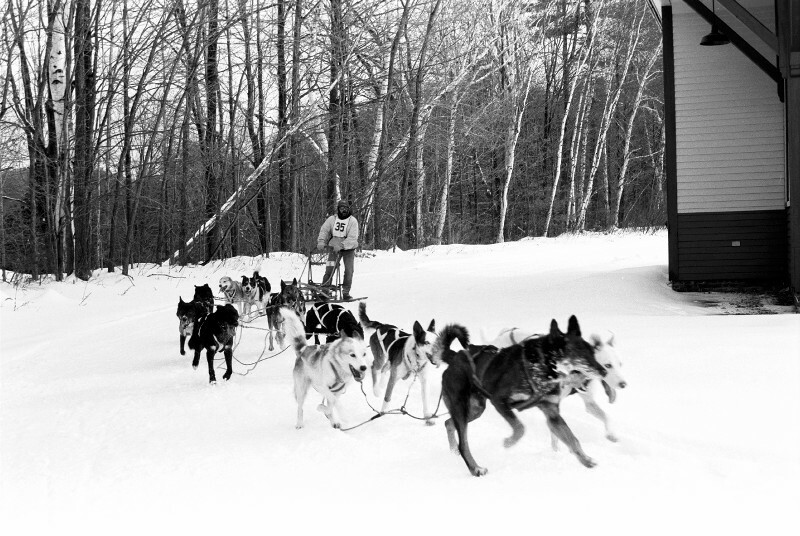 A brake - snook - is used to prevent the sled from overtaking the dogs on downhill slopes. The whole contraption is flexibly bound by leather or synthetic straps. Around 9:30, the races started, and our little group split up and headed to various places on the course to help out with guiding the dogs. 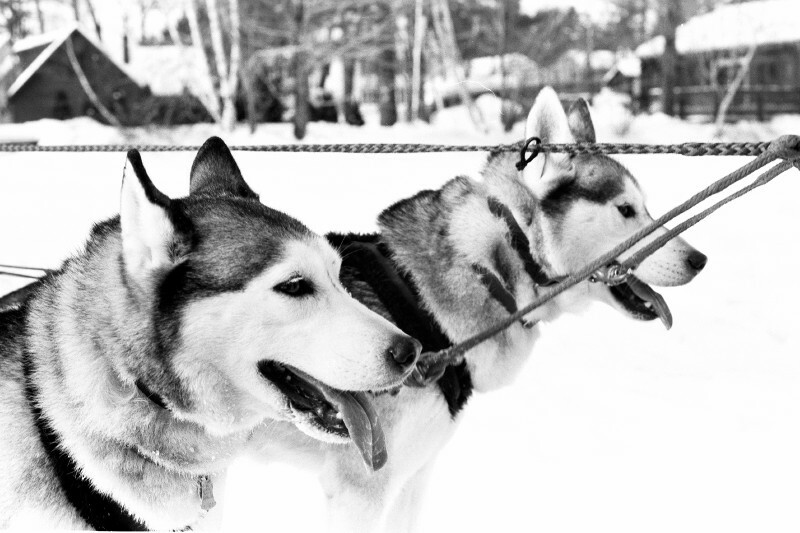 Mushing definitely takes a while to learn, and the dogs themselves require long training. To make the driver's life easier, race helpers stake out the turns and help keep the dog teams on the proper path.. 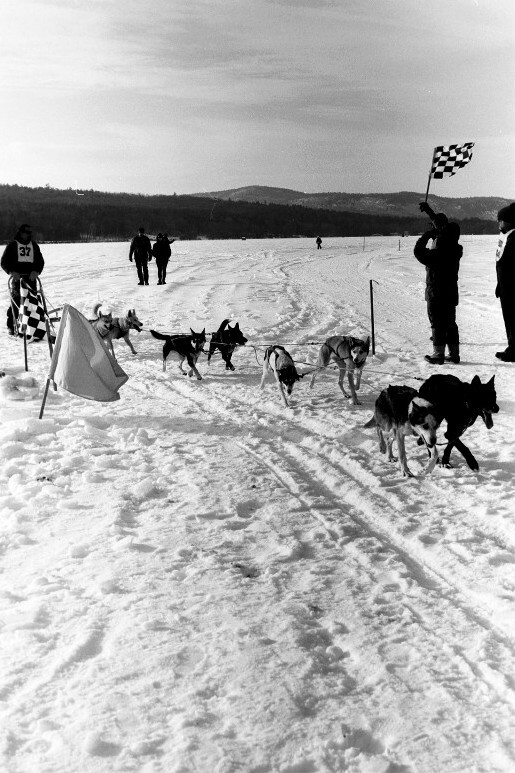 Nonetheless, a few times during the races a pack's lead dog would become confused and veer off course, much to the musher's dismay. Later some of the drivers told us stories about sixteen dog team taking off after a rabbit, tangling and destroying everything in the process. 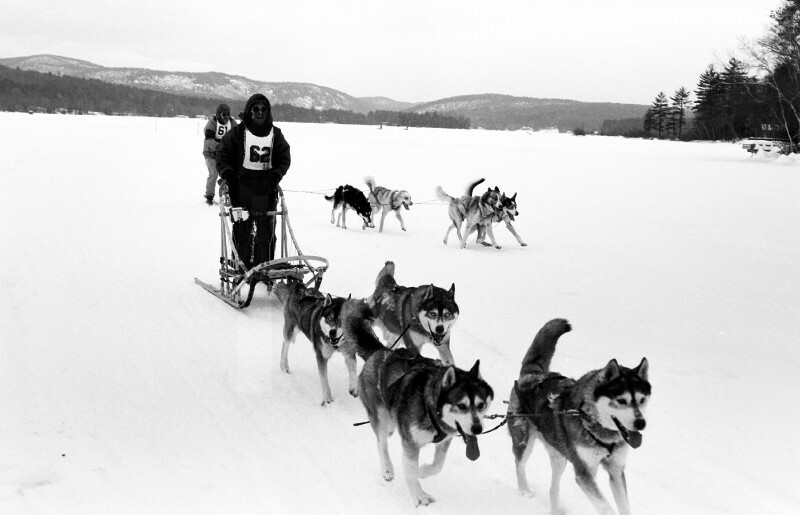 I guess then for the long races like the Iditarod, the driver must have even better control of his pack, not an easy task. 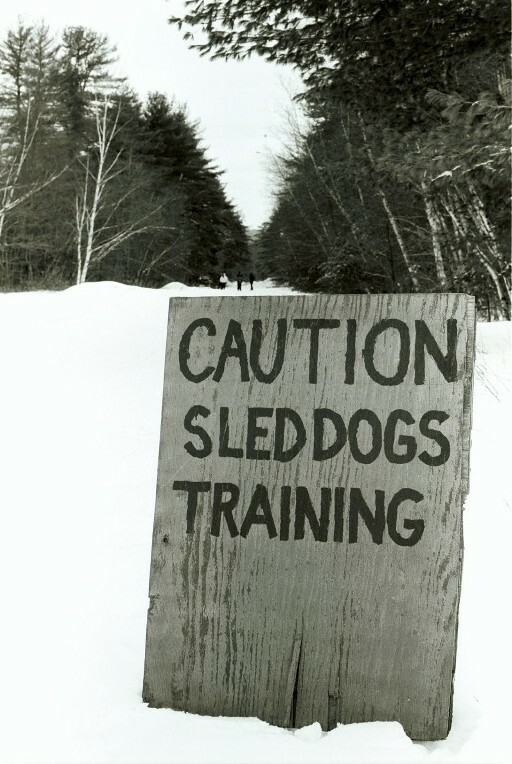 In NH complications also stem from the fact that the dogs share trails with snowmobiles. Needles to say, a suddenly approaching snowmobile may startle and confuse the dog pack much more thoroughly than a rabbit. As a side note, the Mech.E. 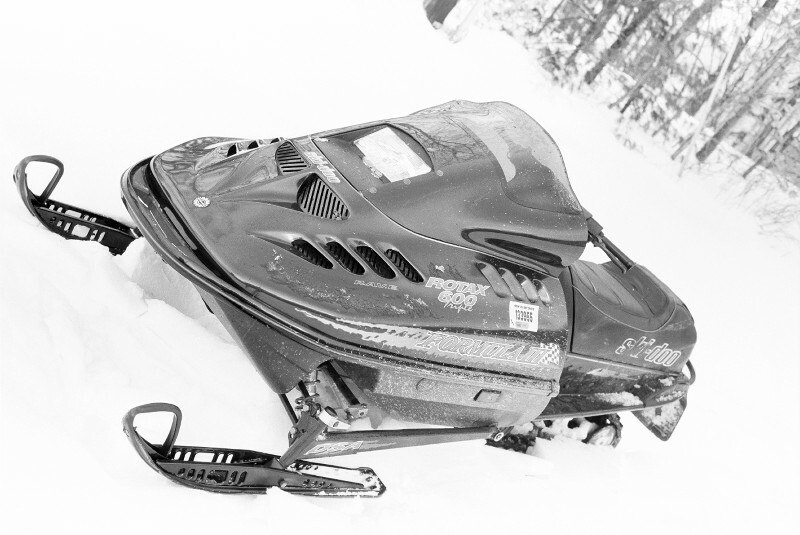 in me finds snow mobiles quite amazing works of engineering. Given that they can go over 120 mph on flat trails, I am not surprised that they can also hydroplane over water. Pretty amazing power stuffed into a rather small machine. On the other hand, the backpacker and climber in me would like to quiet them down just a little bit. Why do they need to be that noisy? 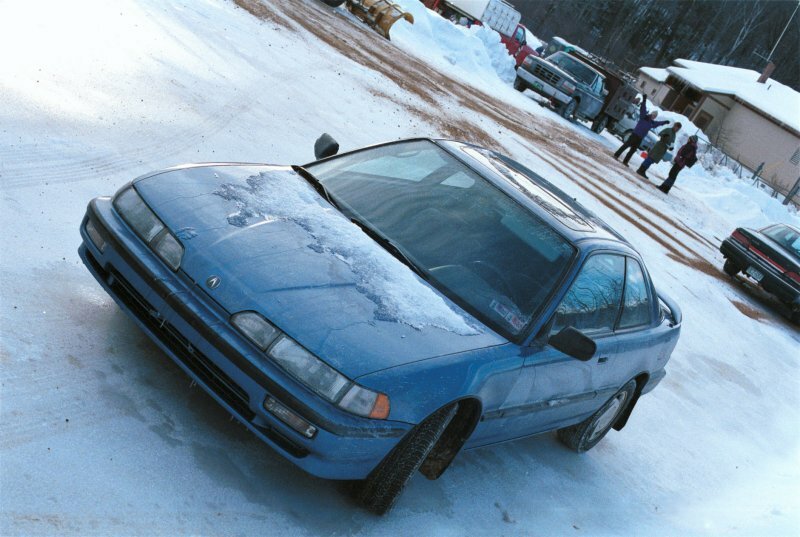 What's wrong with good mufflers? Then again, I never understood the American fascination with Harley Davidson either, so maybe there is some fundamental noise related love that I, as a European, missed out on. But my guess is that sooner or later someone will get pissed enough that the noise issue will become important. Anyway, enough proselytizing. Back at the the starting area, Christine and a few other MITOCers involved themselves with bringing the dogs to the starting line, as well as helping with just keeping the teams in order. With up to sixteen hyperactive dogs trying to bolt in as many directions, I did not envy them. Somehow they seemed to enjoy it anyway. Seeing the dog team suddenly unite in a sprint away from the starting line, spurred by a hearty "GO!" 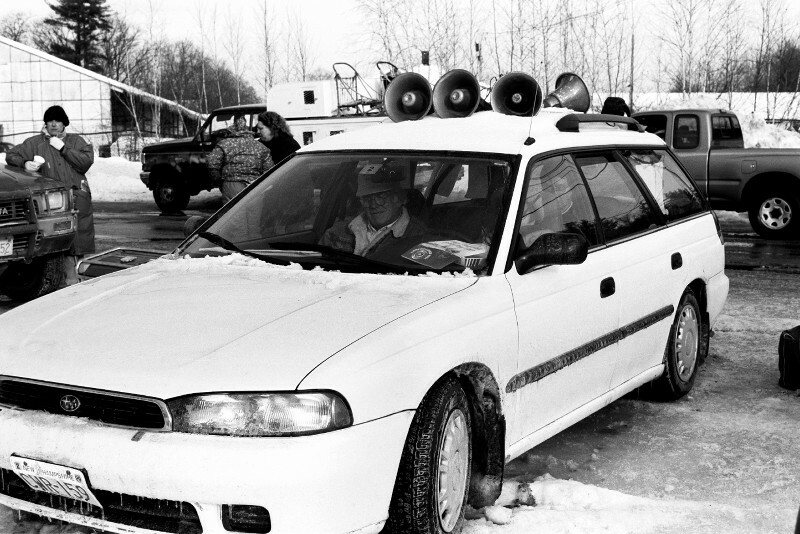 from the sound car, I think I finally understood why people like this sport. 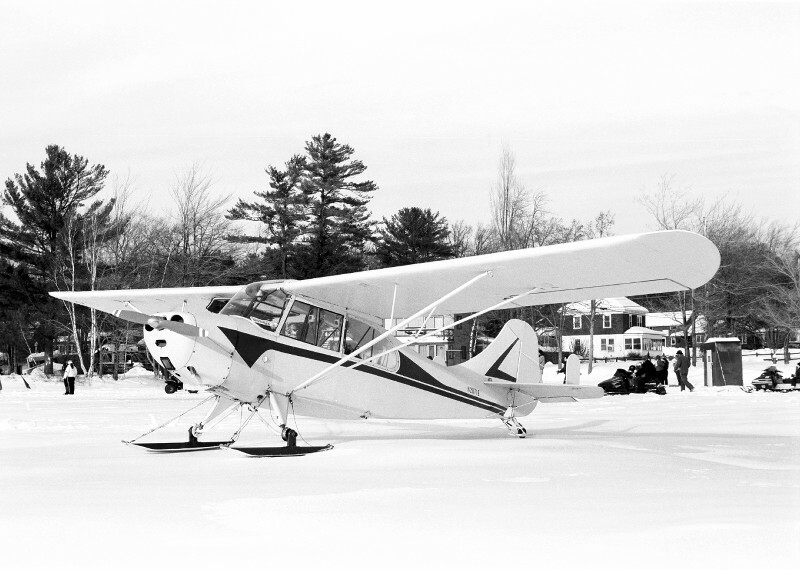 Late in the day, a plane landed on the snow of the lake. 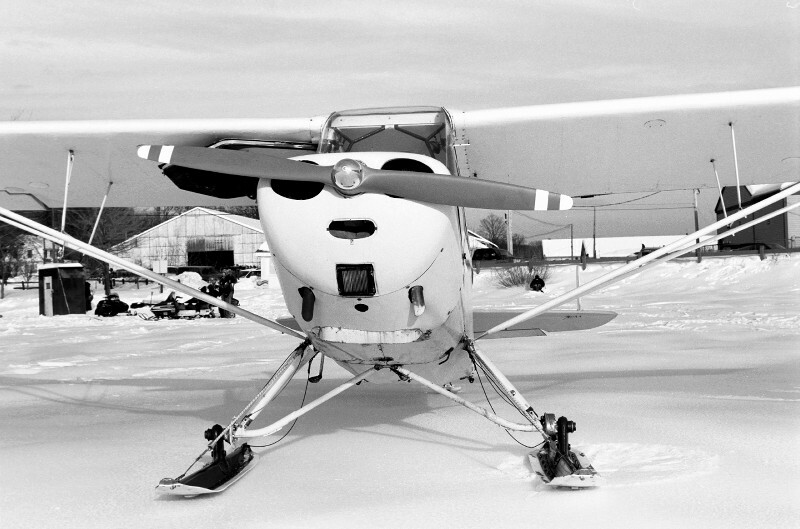 That was probably the first time I had seen a plane with skis instead of wheels, but somehow I was the only one around who showed any interest. Maybe everyone else was just too busy with the race.